The white ankle socks will not be part of the outfit. Now for jewelry and shoes. Do I go with black shoes? 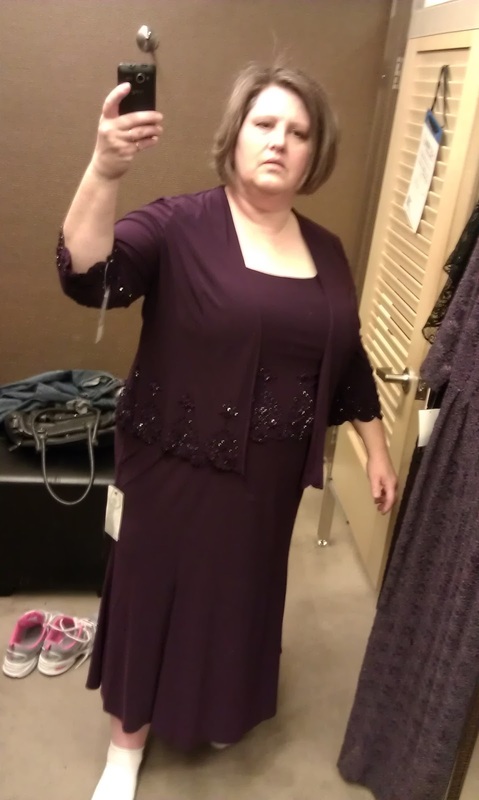 The other wedding color is silver, but I'm not sure silver would go with this dress since the beading is all purple. I think black shoes and black jewelry would be best. Opinions? I think it will be a lovely ensemble once you are all accessorized and gussied up. I'm sure it was difficult to find something in such a specific color. Anytime I go on a search for something in a color I want I almost always come up empty-handed. Will you only be wearing this to the UT portion of the celebrations or in MN as well? LOVELY! I agree with Jen and Katie - don't go shopping with something specific in mind or you'll never find it; I bet lots of accessories will go really well with that dress. I vote "yes". Looks great. It is about time to start counting down!! I also suggest you have that look on your face for all the wedding pictures!! No, I do not support that look on all the photos on the wedding day. Sorry mother, you will be smiling. lol 46 days until the wedding.